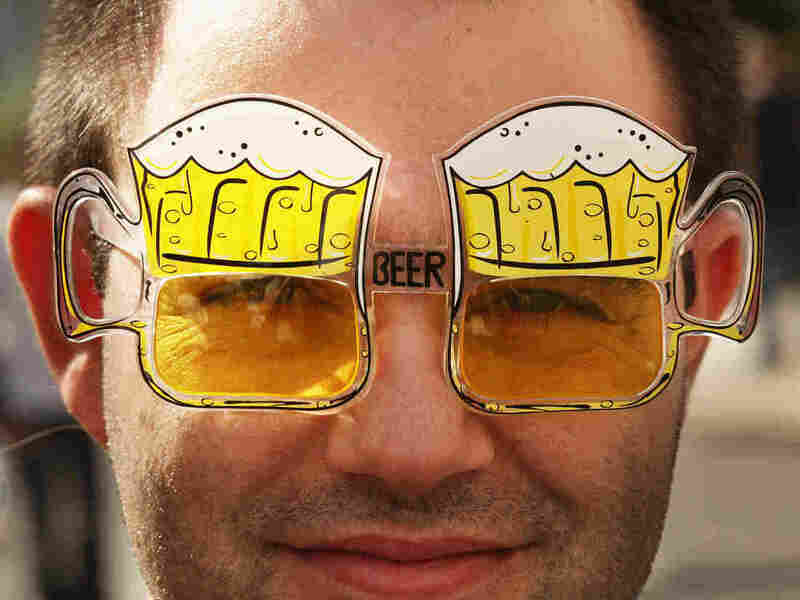 An 'Ig Nobel' For Proving 'Beer Goggles' Work Both Ways : The Two-Way The Ig Nobel awards celebrate work that makes people think and laugh. Among this year's other winners are researchers who discovered that if a cow lies down it will likely soon stand up. "Beer goggles" supposedly make the wearer look better too. Hmmm. Researchers who came to the conclusion that "beer goggles" make you think you're better looking are among this year's winners of the "Ig Nobel" awards. The Igs "celebrate the unusual, honor the imaginative and spur people's interest in science, medicine, and technology." The international team that's been awarded the Ig Nobel's psychology prize produced a wonderfully named study in 2012: "Beauty Is In The Eye Of The Beer Holder." "People have long observed that drunk people think others are more attractive but ours is the first study to find that drinking makes people think they are more attractive themselves," Bushman said. "If you become drunk and think you are really attractive it might influence your thoughts and behavior towards others. It illustrates that in human memory, the link between alcohol and attractiveness is pretty strong." -- Peace Prize. To "Alexander Lukashenko, president of Belarus, for making it illegal to applaud in public, AND to the Belarus State Police, for arresting a one-armed man for applauding." -- Biology and Astronomy. To an international team of researchers that discovered "when dung beetles get lost, they can navigate their way home by looking at the Milky Way." -- Probability Prize. To a team that made "two related discoveries: First, that the longer a cow has been lying down, the more likely that cow will soon stand up; and Second, that once a cow stands up, you cannot easily predict how soon that cow will lie down again." The Igs are awarded by an outfit called Improbable Research, a Cambridge, Mass.-based group that recognizes "achievements that make people laugh, and then make them think." It boasts that "our editorial board consists of fifty-odd eminent scientists, doctors, etc. from around the world, including several Nobel Prize winners and a convicted felon." Several Nobel laureates were among the presenters at Thursday night's awards ceremony.